DVD remains popular especially when there's a big movie or TV show released, despite the video streaming on Netflix or other services gradually wraps around the globe. If you have a huge collection of DVDs, there are many cases you may want to rip the contents off discs and save them in digital format like MP4. 1. You die for keeping cherished DVDs away from teething kids and protect your investment against damage. 2. You intend to clear some space in your room and have all your discs saved in a hard drive so you can archive them and watch anything at any time. 3. You want all movies and TV shows you own to be available at your fingertips on your phones or tablets, Apple TV, etc, without repurchasing them from iTunes or Amazon. Why You Need to Rip and Convert DVD to MP4 Not AVI and MKV? • Rip DVD to AVI Pros/Cons: Due to the minimal compression feature, AVI tends to be larger (2GB in file size maximally) than MP4 and others. Though AVI works with many players and mobile phones, iOS devices like iPhone iPad are excluded from the compatibility list. • Rip DVD to MKV Pros/Cons: Open-source MKV supposedly has better support for subtitles, video and audio tracks. Its commonly used for HD video playback, which nonetheless leads to large space-hogging file. It has the least compatibility unless you install MKV codec pack. But if you stress on quality, MKV is preferred. • Rip DVD to MP4 Pros: MP4 has smaller file size than AVI and MKV, manages to have a good balance between size and quality, thanks to its high compression rate. It allows for sending a copy of movie, streaming over the internet and uploading to web, making it accessible to wide users of iPhone, iPad and other mobile devices. By digitizing DVD disc to MP4 format, sorting your movie library by date, genre, favorite, etc will be much easier. You will no longer need MEGP2 decoder or DVD drive or worry about the DVD regional restriction while playing. If you run into the problem of playing your DVD movies on Mac QuickTime player, iPod, iPhone, iPad or computer hard drive, read the tutorial to find out how to transcode DVD movie to MP4 on Mac for free with the best DVD ripper for Mac. 100% Free Rip DVD to MP4 on Mac - Everything Goes Right! FREE convert any kinds of DVDs (NTSC/PAL) to MP4 H.264/MPEG4, MOV, MP3, etc on Mac with original 480p 29.97fps or 576p 25fps (audio kept with 192kbps high quality). Also let you freely crop image size to remove top/bottom black line for better playback on your iPhone iPad Android devices, Apple TV, etc. Mac has no built-in DVD ripper, though there are add-ons for DVD playing and burning, such as Mac DVD player and iDVD. This is because DMCA claims the illegality of circumventing any copy protections that are generally put on all commercial discs. But you can still find many free DVD converter software available to get movies off discs and turn into MP4, such as Handbrake, VLC, Mac The Ripper, etc, which are well known as free open sources but also poses on many problems for DVD ripping. DVD protection is used to restrict usage of copyrighted works such as commercial DVDs. Nowadays, almost all commercial DVDs are encoded with complicated protection schemes that weed out common DVD converters and manifest in various errors, such as "DVD ripping unexpectedly crash", "takes forever to rip DVD movies", "sector read error", etc. Even with the renown libdvdcss installed on Mac, some software such as Handbrake is reported to only rip regional and CSS-protected DVDs and inform you of no valid source found error, or rip only the first 30 seconds of the movie to MP4 and then it stucks in the rest 2-hour movie ripping process, when facing with typical discs, from, e.g. Disney. When it comes to speed, there are two factors need to be considered: DVD ripper and the computer itself. Higher computer configuration will lead to better DVD to MP4 decoding and encoding performance. But good ripper will take full use of CPU core and GPU encoding to greatly accelerate the DVD to MP4 ripping speed. This seems indispensible especially when you have a large DVD collection. According to the forums, many users report it takes more than 30 min to rip a full-length DVD movie to MP4 using DVDRemaster, even on a highly configured Macbook in hand. We rip DVD not only for backup but also for pleasant playback. So the ability to output high-quality MP4 file is deemed as essential in choosing a DVD ripper. But the truth is most free DVD to MP4 ripper for Mac or PC is not satisfactory. For example, posts on reddit indicate that some tools gets fuzzy and pixilated results that are definitely unwatchable, even though they higher the bit rate. Some users shares their complains on forum.dvdfab that they get the horizontal interlacing lines in the ripped video and the de-interlacing option is greyed out. That's not the end. It results in no sound though the picture is great. * The program can't find the correct title of the movie. * The audio drops out occasionally and won't come back with the Atmos track. * Error message indicates that the source file is corrput or invalid. * Failure to open the disc. It's known to us that the resolution of PAL DVD is 720x576 and NTSC DVD goes to 720x480. Generally, the output MP4 file is kept with DVD original settings if nothing has changed on the parameter settings. However, some users find that they get their ripped MP4 file with wrong picture size, automatically vertically stretched, which mismatches with their playback device iPhone 6s Plus. They wonder if they can crop image size to solve this issue before DVD conversion. It makes a lot of sense to download an easy-to-use program. For example, you might be a green hand, unknown about any parameter settings for either high quality or small file size. You are lazy to go any further steps to fit your mobile devices. Some software such as iSkysoft DVD ripper touts many add-ons that confuse you a lot but doesn't manage to output high quality image. To make a digital copy of DVD to MP4 on Mac in smooth water, MacX DVD Ripper Pro fits the bill. Built in unique DVD analysis technology and title checking mechanism, the standalone program frees you from any title reading problem and offers you the option to cope with protected DVDs that refuse by other programs. It allows you to convert DVD to MP4 (H264/MPEG-4) for better compatibility and also rip a DVD to MP4 with HEVC codec (50%+ smaller than H264 in file size) if you need to play DVD on iPhone iPad Android with only 16/32/64GB space. As for the above-mentioned problems, needless to worry. This program can easily decrypt DVDs and strip any DVD encryption tech from DVDs (CSS, Region Code, RCE, UOPs, Sony ARccOS, Disney X-project DRM, etc.). Thus, your DVD movie can be ripped in full length, no first chapter or 30 seconds rip troubles. High Quality Engine and De-interlacing techs promises you a great quality on both vision and hearing. You can also freely crop image size to remove black lines if mobile device is your destination. Supported output formats: MP4, HEVC, MPEG4, H264,WMV, FLV, MOV, MP3, and 420+ device profiles for Apple iPhone XS/XR/X/8, iPad/Pro, Samsung Galaxy S9/Note 9, PS4, etc. Automatically chose the right title and compatible with any kind of DVD protections. The first and only tool to support all the new and 99-title DVDs. Freely rip DVD on Mac as short as 5 minutes, due to the unique support of level-3 hardware accelleration (Ripping speed depends on the computer hardware). Available for parameter settings (resolution, frame rate, aspect ratio) and video customization (trim, crop, merge, split, add subtitle, etc.). support 4 DVD copy modes: backup the main title DVD to hard drive in MPEG2 with original quality. Support the latest Mac (10.5-10.14) and Windows (7/8/10). The DVD burning feature is unavailable. 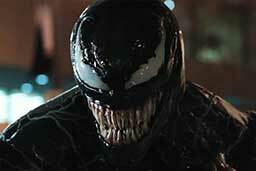 The Movie to be decoded- Venom. * Error message pops up indicating that Venom DVD is dirty even it's brand-new. * The software won't figure out the right playlist, e.g., title 00001 and 357 show the same run time. * The movie will stop playback after several minutes with a cinavia message. Free download DVD converter on your Mac, click "Disc" button to import the DVD files. You can also choose to rip DVD Video_TS folder to MP4 or convert ISO to MP4 by clicking "Path" button. After a few seconds, all DVD titles will be listed and the main title will be automatically selected. Step 2: Choose MP4 as Output Video Format. Here we choose MP4 Video encoded with H264 + AAC from General Profiles category as output format. There is a slide bar available for you to adjust quality and speed. Generally faster speed comes at the price of worse quality and vice versa. Note: You can tweak the parameter settings such as upping the bit rate, resolution, etc to get the best output quality or lowering these settings to ensure a fast DVD to MP4 converting speed. But you have to know that high quality usually leads to slow ripping speed and huge size. This tool helps to reach the perfect balance between quality, speed and size, even you only leave its default profile unchanged. Step 3: Opt for Desired Subtitle Track. Tap the expand icon at the selected main title to open the multiple subtitle tracks list where you can select your desired one, e.g., English, French, Spanish, Forced subtitles only, disabled subtitle or load subtitle you downloaded or made by your own. The same applies to choose audio track that is next to subtitle option. Basically, DVD provides you with AC3 audio with 6 channels. If you just playback DVD digital movie on iPhone iPad Android, audio with 2 channels is actually enough and it can save much space for you. Shift your attention to the lower right corner of the main interface, where you're suggested to manually tick "High Quality Engine" and "De-interlacing" options in case output quality is your top priority. Click "Browse" to choose the path for output files storage. Now tap "RUN" button to start conversion. The pop-up DVD conversion window will show you the processing percentage and the GPU hardware acceleration tech it utilizes: Intel QSV, Nvidia or AMD if your hardware configuration is qualified. GPU HW acceleration tech hands over the DVD ripping tasks from CPU to GPU so as to relieve your CPU from computing-intensive tasks, solve CPU overusage/overheating problems and speed up DVD ripping 5X faster than any competitor. After DVD conversion to MP4 on Mac, you can sync the movie to iPhone iPad with iTunes or MacX MediaTrans, which can transfer videos, including AVI, MKV, VOB, WMV that iDevice won't support, from Mac computer to iPhone iPad, and vice versa. MacX initially features GPU accelerated HEVC encoding. This is especially helpful for Apple users working with the latest macOS Mojave or iOS 12. By converting DVD to HEVC MP4, you will shrink a 7.84GB DVD into a file that is less than 1 GB and therefore store more movie contents on your Macbook, iMac and enjoy them on your newer iPhone or iPad with higher image quality. Verdict: if you have a lot of new movies on DVD and want to make a backup of them, the "copy" feature lets you copy main title to MPEG2, backup full title with all videos/audios/subtitles, and make 1:1 copy of DVD to ISO image with original video/audio in few minutes on Mac. Keep original video quality and original 5.1 channels Dolby AC3/DTS audio. Free download MacX DVD Ripper Pro and enjoy your DVD entertainment now! Handbrake is a piece of preferred software that can deal with DVD to MKV/MP4 conversion on Mac freely. But you have to notice that Handbrake, even the latest version V1.1.1, rips protected DVDs or other new DVD movies relying on VLC libdvdcss to circumvent CSS encryption and sometimes it ends with no valid source found or only first chapter/30 seconds rip when it comes to decrypting newly released DVDs. You might also need to know that the good reputation of Handbrake is spotted by its poor compression ability and high CPU usage (almost 90%), to certain degree. Of course, a DVD ripper without any flaw could never be found. As for the unprotected DVD discs, the outcome is satisfactory. So if you have unprotected DVDs and want a disc to MP4 processing, Handbrake still deserves your trial. Below is the step by step guide on how to convert DVD into digital MP4 on macOS with Handbrake. Step 1: Free download and run Handbrake V1.1.1 on Mac. Step 2: Select a source DVD (no DRM) you need to rip to MP4. Step 3: Choose a title. Generally, the title with the longest duration is thought as the right title. If No valid source found pops out, it may indicate that the DVD is encrypted. For this part, please turn to VLC to read the DVD and find the right title. Step 4: Choose the output format MP4. You can also go to Toggle presets to select the device profiles at the right window. Step 5: Do some setting adjusting. You can adjust the video setting, audio setting, subtitles, and more if you are skillful at this Mac application. Step 6: Click Start button to begin the ripping process. Due to the lack of GPU hardware acceleration tech, it mainly relies on your CPU and might consume your CPU up to 90% so that you'd better shut down other tasks. Problem with Handrbake VLC 2.0 fixed here! There are still some other big names in the market that can freely rip DVD movie to MP4 on Mac, such as VLC, Format Factory, etc. 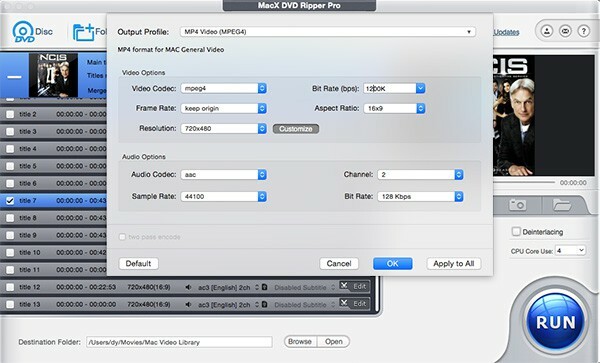 But regarding to users' high request on the decrypting feature, speed, quality and security concern, here we just provide MacX DVD Ripper and Handbrake tutorial, along with the side-by-side performance test listed below, so that you can know which one fulfill your needs in DVD conversion to MP4. Decryption Battle: Handbrake requires Libdvdcss installed to get rid of the CSS put on the Transformers 2 DVD. It takes a few minutes to identify the title. While MacX DVD Ripper Pro automatically choose the right title 76. Specific tests are also performed on other movie titles like Divergent, and Handbrake did encounter some annoying errors like "No Valid Sound Found" whereas MacX DVD Ripper works with 100% successful rate, even when rip the latest DVD Manchester By the Sea, Hacksar Ridge. No issue found so far. 4. The output files are out of order. 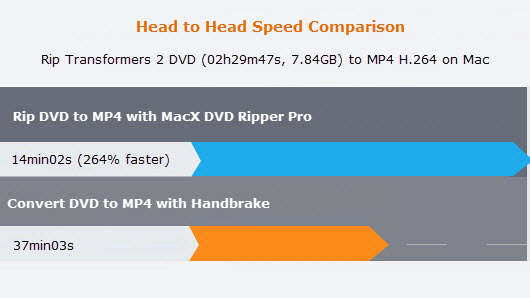 Test showed the MacX performed satisfactory DVD to MP4 converting speed, taking 14 min to rip the full-length Transformers 2 DVD movie to MP4 H.264 video, with FPS reaching almost 276fps. Handbrake was still almost 1.5X faster than other software like VLC. It performed pass 2 encoding for better result and took about 37 min with an average ripping frequency of 129fps. You will also bear in mind the ripping time will lengthen for a high-quality output video and the ripping speed depends on the computer configuration and disc drive. We also do some quality comparison and there isn't any noticeable quality difference, both having a quality closer to the original movie. Besides, MacX DVD Ripper produces a bit smaller MP4 video with file size 1.39MB, compared with Handbrake's 1.87MB MP4 video. 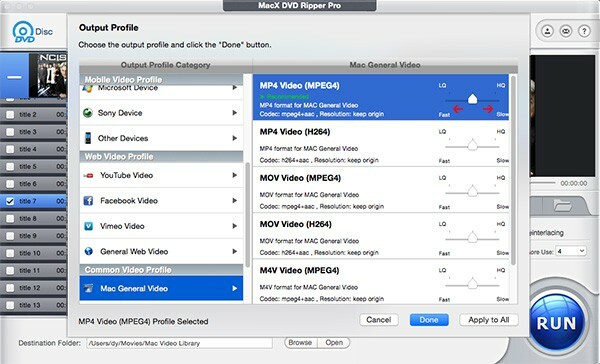 Both MacX DVD Ripper and Handbrake offers the codec options for MP4: H.264 and HEVC. The former converts DVD at quick speed and compresses DVD at a relatively small file size while the latter makes MP4 even smaller and better quality, but requires hefty computing power, thus resulting in slower speed. For Mac manufactured before 2017, just choose MP4 H.264 for smooth DVD ripping. If you have newer models, you can feel free to rip DVD to MP4 HEVC, since the newer models have more powerful CPU and GPU to encode HEVC. Also make sure to have the GPU accelerated DVD ripper to do the MP4 HEVC encoding. Transcoding DVD to HEVC is computer demanding and leads to software freezing or crash. Don't worry, with hardware acceleration enabled, you can fast rip the content of DVD and encode it into MP4 HEVC swiftly, without any crashes or heating up your Macbook. Seeking for the best free Mac DVD ripper? Here is a list of the top three free Mac DVD ripper for you to free decrypt and convert DVD to MP4, MOV, FLV, MPEG, H.264, iTunes videos, etc for your iPhone, iPod, iPad. Want to decrypt and digitize DVD to MKV on Mac OS X with all audio/video tracks reserved? This guide will show you how to free rip & decode DVD to MKV on Mac with highest possible quality.